Chandigarh, November 03, 2018: The Goods & Service Tax (GST) implemented since 1st July, 2017 has ushered in a regime of growth, simplicity and transparency in the country, expressed Mr S K Rahman, Additional Director General, GST, Central Board of Indirect Taxes and Customs (CBIC) at the CII Interactive Session on GST. The Government is coming forward to listen to trade and industry and resolve their issues / concerns faced by them, he added. On the upward trajectory of refunds, Mr Rahman further highlighted that about 92.68 per cent (Rs 38,824 crore) of the total IGST refund claims (Rs 41,889 crore), transmitted to Customs from GSTN as on date have already been disposed. Further, in the case of RFD-01A (ITC Refund) claims with Centre and States, the pendency as on date is only Rs 2,077 Crore. He also informed that out of the refund claims of Rs 39,372 Crore received, provisional/ final order has been issued in case of refunds amounting to Rs 32,345 Crore. In claims amounting to Rs. 4,951 Crore, deficiency memos have been issued. Thus, actual pendency is far less than is being put out for the knowledge of the public. The overall disposal of GST refunds is Rs 71,169 Crore till date. Refund claims without any deficiency are being cleared expeditiously, which points towards increasing success of the GST, he added. On the furnishing of outward details in FORM GSTR-1 by the corresponding supplier(s) and the facility to view the same in FORM GSTR-2A by the recipient is in the nature of taxpayer facilitation and does not impact the ability of the taxpayer to avail ITC on self-assessment basis in consonance with the provisions of section 16 of the Act. The apprehension that ITC can be availed only on the basis of reconciliation between FORM GSTR-2A and FORM GSTR-3B conducted before the due date for filing of return in FORM GSTR-3B for the month of September, 2018 is unfounded as the same exercise can be done thereafter also. Sharing amendments regarding simplification of the GST Returns, Mr Rahman, shared the original concept of four Tax returns in a month has been gradually curtailed to two tax returns with provision of Quarterly Returns for small taxpayers. Introduction of e- way which has been made mandatory, has led to simplification of the movement of goods from one place to another. This has led to abolition of Check Posts, faster transportation without any delay. Further, the amended Schedule III provides for no payment of IGST, if the goods are sold in warehouse. Sharing the Industry perspective, Mr Santosh Dalvi, Partner and Deputy Head, Indirect Tax, KPMG in India shared that adoption of technology by stakeholders is the key to reap the real benefits of GST. One major ask by the industry from the Government is that don’t insist on matching up of credits for few initial years, said Dr Waman Parkhi, Partner and Head, North India, Indirect Tax, KPMG in India. CII organised the Interactive Session with CBIC and was attended by around 75 CXO and seniors officials from the industry. This session was organised in partnership with KPMG as Knowledge Partner. 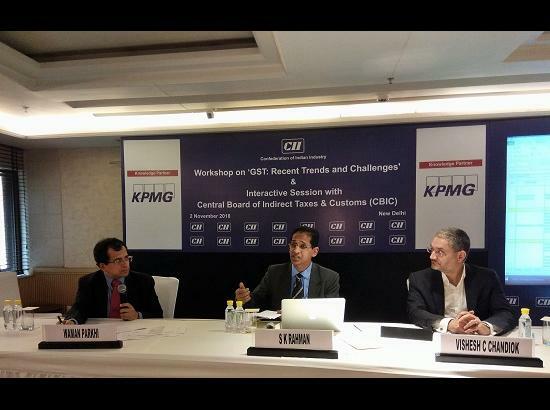 Experts from KPMG India addressed key issues related to GST including recent changes, GST Audit & Filling of Annual Returns: GSTR 9/ 9C, Authority of Advance Rulings : Recent Rulings & its Impact, Anti – profiteering, refund - Export & Inverted Duty Structure, Valuation & Input Tax Credit etc.